Vamping - Beginning Banjo Backup: Vamping? “And just what is vamping?” you ask. Good question! When you vamp on the banjo you play four-finger chords to accompany someone who is singing or playing a solo. Vamping is a must for playing with other people. 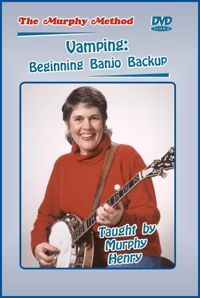 On this DVD we show you how to make the vamp chords (G, C, D, F, Em) and how to use them to play along with all the tunes on Beginning Banjo Vol. 1 and 2. Vamping brings you one step closer to improvising and is the foundation for the fancy backup you hear on recordings. Plenty of slow playing so you can play along. Use this DVD after you have learned 4 or 5 songs. No Tab.